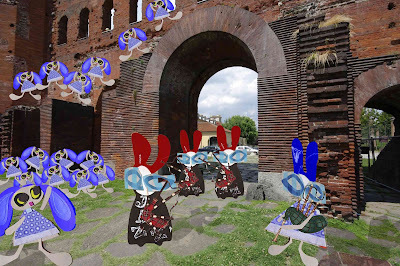 Lapinette and the blue team waited patiently but never once saw the Wabbit’s team move. Having emerged from the secret tunnel some distance away, the Wabbit and his confederates circled around and approached from the rear. Then just before the gates they lifted their secret weapons and marched straight through. Startled, the blue team was confused. But suddenly the Wabbit lifted the bagpipes that Wabsworth had somehow obtained from the military shop in Crocetta. Air filled the bag as joined by his friends, he blew into the chanter with one enormous breath. Such a terrible din rose from the drones and echoed round old brick walls that the Wabbit alone sounded just like an army of four hundred. When the drone settled to an even menacing pitch that the Wabbit thought just right, he turned to Sergeant Khargoosh. "What tune Khargoosh?" he asked, "it's your choice." "The Barren Rocks of Aden," said Khargoosh immediately. They blew with all their might and all their paws floated merrily across the chanters. Their bagpipes squealed and skirled into a tune that was so infectious, the blue team dropped their weapons and began to dance helplessly. Lapinette frowned with her paws on her hips but she couldn’t stop herself. Without warning, she threw up her arms and then she too danced a Highland Fling with abandon. "I think that’s our round!" shouted the Wabbit to Wabsworth. "How long can you keep playing?" asked Wabsworth. "Days," said the Wabbit.